One of the early Impressionist painters, Frederic Bazille trained at the Parisian atelier of Charles Gleyre (1806-74) - a devotee of plein air painting - together with Claude Monet (1840-1926), Auguste Renoir (1841-1919) and Alfred Sisley (1839-99). The credit of having invented open-air portraiture belongs to Bazille and Monet. After 1865, Bazille painted the Pink Dress (c.1864, Musee d'Orsay), and Monet painted his Picnic (1865-66, Musee d'Orsay) at Chailly. These two works, however, though begun in the open air, were finished in the studio, whereas The Family Reunion was, apart from a little retouching, painted entirely out-of-doors. Note also that Bazille's style of Impressionism was more realist than that of Monet. His tragically early death in the Franco-German War of 1870 robbed French painting of one of its greatest possibilities. For more background, see: Realism to Impressionism (c.1830-1900) and Characteristics of Impressionism (1870-1930). Bazille was close friends with Renoir and Monet, sharing studios with both. He especially admired their open-air paintings. During the summer of 1867 in the family home at Meric, near Montpellier, he set up his easel beneath the big chestnut tree on the terrace. From there he overlooked the picturesque village of Castelnau, separated from Meric by a ravine in which flows the River Lez. Family Reunion also called Family Portraits features all the members of his family. 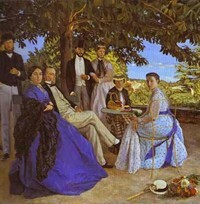 In the foreground, sitting on a bench, are his father and mother; at the back, the eldest of his cousins and her husband Monsieur Teulon; at the round table, Madame des Hours, Bazille's maternal aunt, with her daughter Therese; sitting on the parapet of the terrace, Camille des Hours, his youngest cousin, beside the young Marc Bazille; on the extreme left, standing, his uncle des Hours, behind whom can be seen, half-hidden, the tall silhouette of the artist, which he himself added. See also: Impressionist Portraits. Motionless and gazing directly at the artist, these people give the impression of posing for a photograph. They are out-of-doors but this has not prevented them from keeping to a rather stiff pose, of the kind often taken up by a model in an art school. The likenesses, which one feels are very good, increase this impression. How different they are from Monet's Women in the Garden (1866-7, Musee d'Orsay), who are silhouettes in a natural setting rather than portraits. Perhaps the Protestant origin of the Bazille family partly accounts for this dignity, austerity, and self-sufficiency. Bazille did, however, retouch this big picture in a few places, for the following winter he wrote from Paris to his parents: "I shall send the Meric picture to the exhibition. I have retouched it. I have put in some little dogs and redone the heads of Pauline and Camille which I didn't like. I have begun this and shall finish in a month's time." He changed some more, in fact, replacing the little dogs by a still-life in the foreground; flowers, a hat and an umbrella, beside luminous patches of sunshine on the ground. These compromises may explain why his work was accepted by the Paris Salon in 1868 while Monet's more daring paintings were rejected. The strong contrasts demonstrate the artist's liking for the light of the South of France. The group is gathered in the shade, which enhances the vivid colours of the landscape and the sky. The light filtered by the overhanging foliage accentuates the pale clothes of the group, contrasting with the dark hues of the shawl and jackets.  Olympia (1863) by Manet.  Portrait of Emile Zola (1868) by Manet.  Portrait of Berthe Morisot With a Bouquet of Violets (1872) by Manet.  Portraits at the Bourse (1879) by Degas.  Daughters of Edward Darley Boit (1882) by John Singer Sargent.  The Boy in the Red Vest (1889-90) by Cezanne.  For analysis of other Impressionist portraits, see: Homepage.